No human has ever seen this comet before as she was out of the earth's orbit.
. ISON has been on its way sunwards for a million years. This capture of Comet Ison was taken on Nov 22nd at 6.20am in a direction East-South East over the clear skies of Neath using a 30 sec exposures over a 2 hour period - taken 2013-11-22 06:20:36 one hour before dawn, and waiting for mercury to rise over the horizon. The plume 16 Million Kilometres Long can be clearly seen here as the comet is approaching a star trail and the setting moon. This was the last sighting, as she was approaching the suns orbit. Did she survive? 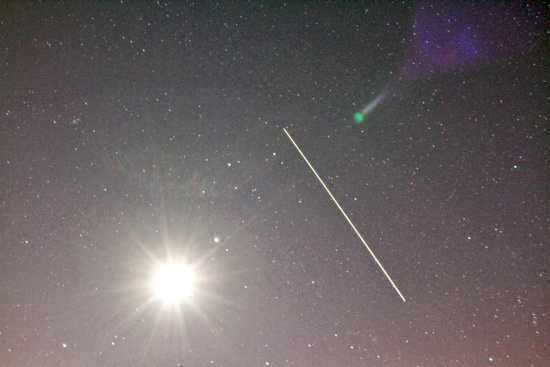 The comet did fragment, however, if she is still visible the next sighting over the UK is 5am on Dec 20th & 25th. Comet ISON headed towards the centre of our Solar System in Novembers passing within 1.2 million miles of the Sun’s surface. At the time of discovery in September 2012, ISON was over 584 million miles from the Sun. Its average speed in July was 55,405mph. It continued to accelerate steadily until November when it whipped around the Sun at an astonishing 425,000mph. Early data analysis suggested Comet ISON’s size to be around three miles in diameter. Most astronomers now believe that the comet was destroyed by solar heat with Nasa stating a 90 per cent probability of this having happened. What they believe remains now is a small pieces of rubble, around 10 metres in radius. There is, however a 10 per cent chance of it having left behind some important fragments 100m radius or larger which will be big enough to study. "The tail of the comet stretches more than 7 degrees across the sky--It's almost as wide as the bowl of the Big Dipper." but imagine how they must have captivated our ancestors, who spent far more time under the starry night sky! For thousands of years, people have wondered about the stars. What are they? How far away are they? What is the meaning of their arrangement in the sky? How do their locations in the sky change over time, and why? The stars also "rise" and "set" just like the Sun and the moon. 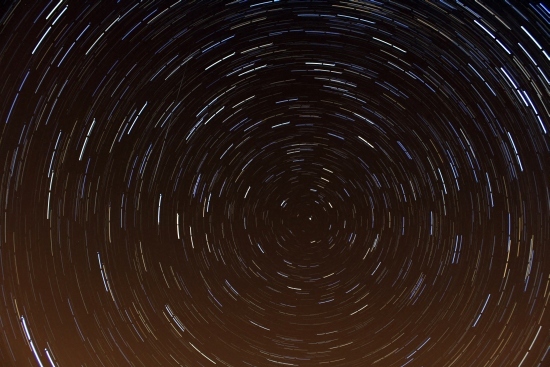 The North Star or Pole Star – aka Polaris – is famous for holding nearly still in our sky. In this image the North star is clearly visible. where the Earth's North Pole points. The North Star (Polaris). Thus, as the sky rotates above us (meaning, we turn against the background of the stars), the North Star should not move very much. (It moves just slightly because the axis is not quite pointing at the star - but basically the North Star is always in the same point in the sky for us). What about the stars near the North Star. They will rotate around the North Star. If you face the North Star, the stars will appear to rotate counter-clockwise around that point. As you get farther from the North Star, the stars still rotate, but their trails appear to straighten out (and the tracks seem longer). .These two effects are connected - the star farther away in the sky makes a larger circle with respect to the North Star - so a segment of its path should appear straighter than near the North Star. Also, since the distant star has to go all the way around its bigger circle in 24 hours - it has to cover more "distance" along that path in a 10 minute period than a star that is making a small circle around the North Star. 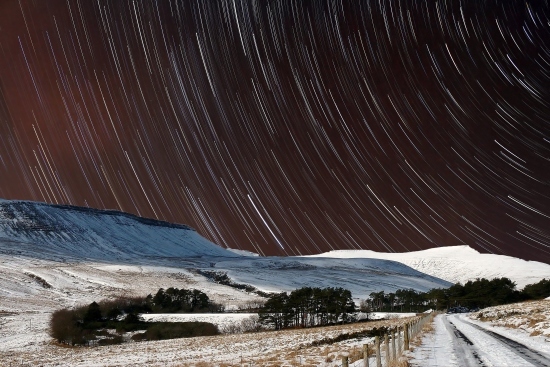 See the wonders of the Sky At Night right here and brought exclusively to your screens by Neath Guardian photographer Mike Davies. View full screen and listen to the music of Gustav Holst "Jupiter, the Bringer of Jollity".